A team of Inserm researchers from the Cardio-Thoracic Research Centre of Bordeaux (Inserm/University of Bordeaux and Bordeaux University Hospital) has demonstrated the clinical efficacy of gallopamil in 31 patients with severe asthma. This chronic disease is characterised by remodelling of the bronchi, which exacerbates the obstruction of the airways already seen in “classic” asthma. In contrast to the reference treatment, gallopamil has proved capable of reducing the bronchial smooth muscle mass. This work is published in the 29 January 2015 issue of the American Journal of Respiratory and Critical Care Medicine. Severe asthma is a chronic condition of the airways that affects between 1 and 3% of the world population to a highly variable extent, depending on the country. It is characterised by persistent breathing difficulty, restricted physical activity, frequent nocturnal attacks, and prolonged asthma attacks that require systemic treatment. These symptoms lead to a considerable number of emergency hospital admissions, have a serious impact on the quality of life for patients, and can even result in death. In severe asthma, bronchial obstruction causes a strong reduction in respiratory capacity. This bronchial obstruction is due to remodelling of the airways, particularly the thickening of the bronchial smooth muscle (BSM) that surrounds them. This phenomenon is associated with a poor prognosis and resistance to even intensive treatment. Until now, no pharmaceutical drug has succeeded in preventing the excessive proliferation of these muscle cells, including corticosteroids, the reference treatment for severe asthma. In previous work, Patrick Berger and his colleagues had already demonstrated in vitro and ex vivo that this disproportionate growth was triggered by an abnormal entry of calcium into these bronchial smooth muscle cells. 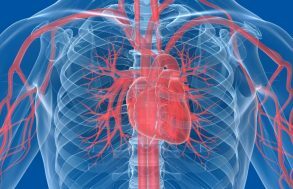 In this same article, the scientists had demonstrated in vitro the anti-proliferative effect of gallopamil, which is normally prescribed for certain heart conditions because of its blocking action on calcium channels. 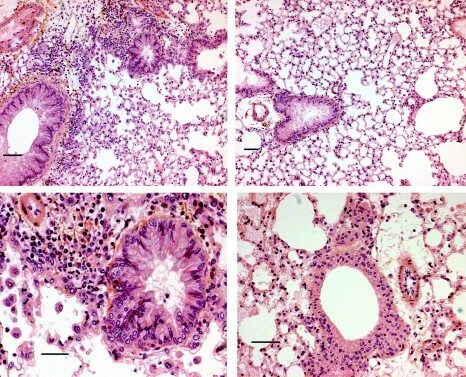 © Inserm, Pelletier L. The left pictures show the characteristic look of lung inflammation in asthma with thickening of the bronchial wall, a lot of inflammatory cells and an abnormal production of mucus. Mice treated with the calcium channel inhibitor (on the right) are completely protected. 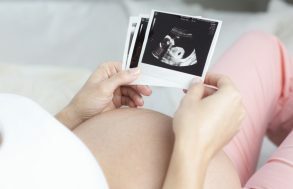 To assess its in vivo efficacy, the researchers then initiated a clinical trial sponsored by Bordeaux University Hospital and supported by the French Ministry and Health and Inserm. For 12 months, they thus measured the effect of the drug on the thickness of the BSM and bronchial wall, and the frequency of asthma attacks in 31 patients. On analysis, the data showed a significant reduction in BSM in asthmatic patients treated with gallopamil compared with the placebo group. The drug therefore enabled a significant reduction in the thickness of the bronchial wall in patients. After this phase, both patient groups were monitored for 3 months after stopping treatment. It then became apparent that individuals treated with gallopamil had significantly fewer prolonged attacks than the placebo group. This pilot study thus provides proof of concept that the calcium channel blocker is able to reduce bronchial remodelling through its action on the smooth muscle cells in individuals suffering from severe asthma. Other studies involving larger patient cohorts will have to be put in place to confirm these results. Moreover, although gallopamil seems to affect the occurrence of prolonged asthma attacks, Patrick Berger emphasises the need to test gallopamil over a longer treatment period in order to confirm this observation. The episodes are also medically referred to as exacerbations.